It all started in 1911. Next week, the National Orange Show in San Bernadino, California will be celebrating more than a century of citrus fun. This festival is the biggest and oldest event of the year in San Bernadino with crazy things like wild turkey races, a tractor pull and circus acts. Each year they have a pie contest, and I happen to have an old tattered newspaper clip from 1967 of the recipe from that year’s sweepstakes winner! It was stuffed in an old recipe box I bought while antiquing. This luscious Lemon Velvet Pie is truly is made the old fashioned way, by tempering the eggs and adding them into the hot custard. 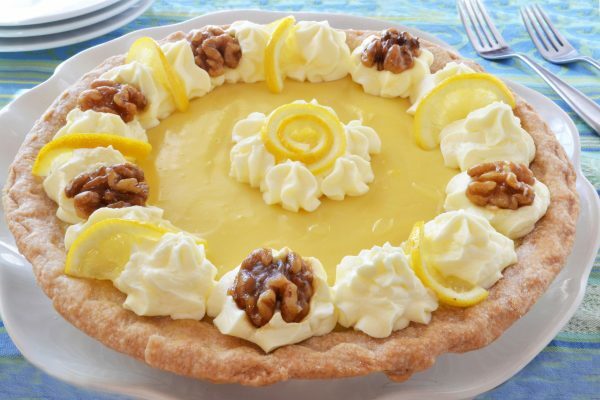 I couldn’t quite figure out how walnut halves factored into a recipe for lemon pie, but the dark walnuts set into whipped cream dollops on bright lemon pie certainly make it a stand out. It might even be the reason Mrs. Mary Gross, who is credited with this award-winner, decided to add them to the top! Preheat oven to 350 degrees. Sprinkle 2 teaspoons of sugar over unbaked pie crust. Bake for 15 minutes or until golden brown. Let cool. In a saucepan, mix sugar, cornstarch and salt, whisking to combine. Add boiling water and stir constantly until mixture has dissolved. Bring to boil over medium heat. Continue to let boil, stirring constantly for 3-4 minutes. Separate eggs and slightly beat yolks in a medium bowl. Add some of the hot mixture to the yolks, blending well. (This is called tempering so the eggs don’t cook too quickly.) Return egg mixture to saucepan and add butter. Cook for 2 minutes, stirring constantly. Do not bring to a boil. Remove from heat. Stir in lemon juice, lemon peel and vanilla. Soften gelatin in cold water. Add to hot mixture, stirring until thoroughly dissolved. Add light cream or and blend or whisk until combined. Refrigerate until slightly thickened but not set, about 20 minutes. Beat egg whites until stiff but not dry. Gently fold into chilled mixture and pour into baked pie shell. Top with whipped cream dollops around the edges. Place walnuts evenly around the pie in the dollops. Another idea for Lemon Pie! One of the most popular recipes with our Rescued Recipe readers is the Lemon Pie in a Blender. Yes, literally, everything gets thrown into a blender and then poured into a pie shell! If you missed that amazing recipe, you can find it here.